All things California desert: Travel, politics, environment, adventure, offbeat experiences, local hotspots, insider's tips, people and commentary about life in Palm Springs, the Coachella Valley and the California desert region. Click on the Article Header to read the whole story! Imagine this: Once a week, a box of fresh, organic and locally grown produce and herbs arrives here in the desert, with your name on it. All year long. Sound like a fantasy? The dream has come true with the Inland Empire CSA. Community Supported Agriculture (CSA) is a partnership of mutual commitment between a farm or farms and a community of supporters that provides a direct link between the production and consumption of food. Consumers help to cover a farm's yearly operating budget by pledging (purchasing) a portion of the season's harvest. 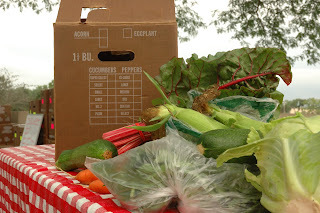 CSA members make a commitment to support the farms throughout the season, and assume the costs, risks and bounty of growing food along with the farmer or grower. The pledge helps to pay for seeds, fertilizer, water, equipment, maintenance, and labor. In return, the farms provide a healthy supply of seasonal fresh fruit, vegetables and herbs throughout the growing season. Becoming a member creates a responsible relationship between people and the food they eat, the land on which it is grown and those who grow it. I'm the editor of a local weekly newspaper in the Coachella Valley of California. I've also published two lifestyle magazines and am currently at work on two books - of fiction and non-fiction.